Home / Dynasty / Opposing views: Is Baker Mayfield a top 5 dynasty QB? Opposing views: Is Baker Mayfield a top 5 dynasty QB? JG: This is a very exciting series I’m glad to be apart of for the Nerds fanbase. I give Garret all the credit here. He reached out to a few members of the Nerds staff with various different topics to debate. I chose the Baker debate because of how much of an exciting player he is not even one year into his pro career and also because the Nerds are based out of Cleveland. I’m excited to get into this and look forward to debating a few different topics this year with both Garrett and other writers on the Dynasty Nerds staff. Baker Mayfield is one of the most polarizing NFL players in recent memory, so it only makes sense that his divisiveness would also translate to the fantasy gridiron. In my mind, there are 4 main things that make a player a valuable dynasty asset. The beautiful part about Baker is he checks everyone one of those boxes easily in my mind. I don’t want to come off as a Baker Mayfield hater because how can you not like this guy? I mean really he is energetic, emphatic and is not scared to let you know how bad he wants to beat you. My take on this article will not be to slander Baker but to just debate his place among the dynasty QBs overall heading into the 2019 season. This whole idea is Garret’s so I worked off his four key talking points and gave my opinion on those. Most of the readers know me by now and my content can get a little wordy I did my best here to keep my opinions at a minimal to not overwhelm you guys on our first shot at this article style. GP: I think even the biggest Baker hater has to admit that this young man has incredible ability. In just 13.5 games this year he passed for 3,725 yards while throwing 27 touchdowns and just 14 interceptions. 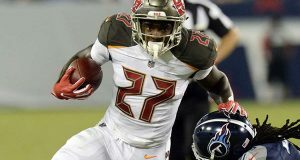 Not only are his 27 touchdowns an NFL rookie record, but this season he had more touchdowns than Aaron Rodgers and Cam Newton. He consistently plays with a chip on his shoulder, even when there is no reason for it; he is always hungry and desperately wants to be the best. Oh, I almost forgot one of his greatest assets, which is his accuracy. Under his time with Freddie Kitchens (more on that later) He threw for an excellent 68.44% which would have ranked 7th in the league for an entire season. JG: Garret Price did a solid job here mentioning the stats Baker put up in just 14 games played and when a guy comes in and sets a rookie record for TD passes how do you debate this. I’ll start with the pros Baker has been proving people wrong his whole career from his walk on story in college to winning the heisman and seemingly becoming the first overall pick in last years draft overnight. What makes Baker special to me is how underrated his arm is and his ability to extend plays and just win football games. Mayfield has above average numbers on deep throws and really is a polished red zone passer. This is where I debate his overall talent as much as I like about Baker there are concerns long term. Baker is smaller for a starting QB and while everyone wants the next small QB to be Drew Brees the facts are the facts and there’s only one Brees. Baker Mayfield tends to default to sloppy footwork and throwing off his back foot when he’s rushed which we saw a lot of in his early season starts. Also with Baker coming from a spread offense he was very used to bigger window throws which I believe going into his second NFL season won’t be as readily available as they were this season. While the numbers are hard to dispute I’ll get into later why we should pump the brakes on top 5 talk at least for now. GP: Not since the early 90’s would someone say the Browns were a good situation, but buddy boy, The Cleveland Football Browns are a good situation in 2019. The Browns now have a competent GM in John Dorsey, that not only rebuilt the Browns in what seemed like overnight, but also spent time with Green Bay and Kansas City and contributed to numerous excellent draft choices in those cities. I expect him to get Baker Mayfield all of the weapons and protection that he needs. Baker also showed his biggest improvement last year once Freddie Kitchens became the offensive coordinator. Under Kitchens, Baker had a completion percentage over 68% while throwing for 281.8 YDS/GM and 2.4 TD/GM; now Kitchens is the Head Coach. On top of that the Browns have a young receiving core, led by 26 year old Jarvis Landry, that should only get better in the 2nd year of the same offense. Couple all of that with a dynamic young runner like Nick Chubb and that just screams offensive potential. The last aspect of the situation that intrigues me is the division. The Steelers and Bengals both seem to be trending in the wrong direction while the Ravens, while still formidable defensively; have several aging stars on that unit. I expect the Browns to be in every single division game this coming season. JG: Again, I have to agree with Garret here on the Browns finally being in a good situation and the fans of Cleveland finally deserve this no doubt. Baker Mayfield was very average prior to Freddie kitchens calling plays he had thrown for 1,471 yards with 8 touchdowns and 6 interceptions. After Kitchens took over Baker put up 2,254 yards and 19 touchdowns to only 8 interceptions. It’s obvious something special was there in the relationship between Kitchens and Mayfield. Freddie Kitchens now the new Browns head coach looks like he will call plays in 2019 as I looked at the numbers from 2018 this didn’t scream top 5 dynasty QB to me. 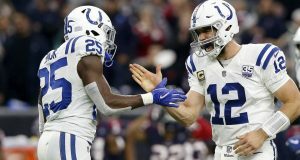 In 2018 the Browns finished 13th in yards per game, 20th in points per game, 14th in pass yards per game and 14th in rush yards per game. If anything the Kitchens play calling screams balance to me as an analyst. In today’s NFL you need balance and as much as I like what Kitchens did in his first season I wouldn’t consider him an elite offensive mind. There’s no doubt in my mind Kitchens improved the offense greatly when he took over. Kitchens improved the RB usage and turned a rough offensive line into a very formidable unit by seasons end. 2018 was the first time Kitchens called plays in the NFL this is what really concerns me going forward. Typically in the NFL when defensive coordinators get a year of film on offenses they adjust accordingly we are putting a ton of faith in Kitchens as a premier play caller with less than a year experience if we are going to call Baker Mayfield a top 5 dynasty QB. GP: Many quarterbacks have their floor season in their first year. If this is Baker’s floor, then that means roughly 4,200 yards and 31 touchdowns for a full season of work. A full season of work that included a coaching change, I might add. So for arguments sake, let’s say he only improves slightly statistically and averages 4,500 yards and 35 touchdowns over the next decade and keeps his interceptions and rushing yards exactly the same while totaling just 2 rushing touchdowns. If that were the case, then Baker is looking at roughly 317 fantasy points each season. That would have been good enough for quarterback four, two, and six over the seasons of 2016-2018. I also don’t believe that this is a crazy aggressive prediction. If we see him improve his decision making and he cuts down on his interception totals, then that will only add to his fantasy goodness. I also expect the Browns to address the WR position in the coming years and eventually give him a true number 1 at that spot. Baker is absolutely trending up and I believe that the sky is the limit for this player. JG: This was the one point I had the most interest in. Baker’s floor in my opinion isn’t over 4,000 yards or 30 touchdowns. I realize in todays game this isn’t extremely difficult to do but in a record breaking offensive year only nine QBs threw for more than 30 touchdowns. While the 30 touchdown club is impressive in today’s NFL it’s not something that automatically classifies you as a top tier QB. I look at guys like Blake Bortles who threw 35 touchdowns before turning 24, Andy Dalton who had 33 TDs at age 25, Derek Carr who threw 32 at age 24, Carson Wentz who threw 33 just last season and Jared Goff who tossed 32 touchdowns this season with the Rams. Now when these guys threw these touchdowns they weren’t rookies so it’s fair to debate that point but also Baker came in as the oldest and most accomplished passer in last years draft. I won’t take anything away from him breaking a rookie passing TD record is impressive but I think we have to pump the brakes on his ceiling. Derek Carr is a good example if you take out his 32 touchdown season he has passed for over 3,200 yards and 20 touchdowns in five of six NFL season but he finished this season as the QB26 and in dynasty leagues he’s not even on anyone’s radar unless we are talking superflex leagues. 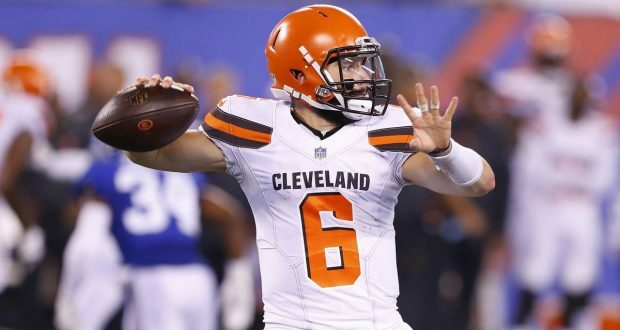 Mayfield averaged 17.1 fantasy points per game this season that was lower than Josh Allen, Kirk Cousins, Jameis Winston, Carson Wentz and mitchell Trubisky. There’s room to argue there with Wentz and Allen and Winston all not playing full games or full seasons obviously. Baker’s 240 fantasy points tied him with Eli Manning for QB16. While I’m excited about Baker after his rookie season I’m not ready to call him top five among QBs yet. GP: Baker will be 24 at the beginning of next season. As he is ascending, while the likes of Brady and Brees will be retiring and Rodgers, Big Ben and Rivers will be heading into their final seasons. The way I see it now, Mahomes and Luck are on their own level, while Rodgers should be a top 5 since he likely will play for another half decade. That leaves Deshaun Watson and Baker Mayfield to battle for the 4 and 5 spot in my top 5 dynasty quarterbacks. Many of the guys that would likely come next (Newton, Wilson, Goff, Wentz, Cousins etc.) all seem to have at least one thing in the 4 listed above that I don’t love, with the potential of injury risk being included. Baker could easily be a set it and forget it QB for the next 12 seasons and I wouldn’t be surprised in the slightest. JG: How does the saying go “age ain’t nothing but a number” well in this case it couldn’t be more true. QB is the one and only position in dynasty leagues where a guys age isn’t the determining factor. Mayfield will turn 24 right around the NFL draft and coming off a 27 touchdown rookie season he should be getting all the hype he is. My case for him not being top 5 really has more to do with his competition than him as a player. 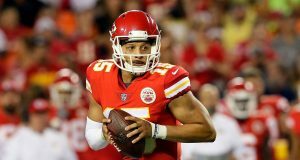 In my views Patrick Mahomes, Andrew Luck and Aaron Rodgers can’t be debated for top 3 dynasty QBs. After this we enter the area of Russell Wilson, Deshaun Watson, Jared Goff, Cam Newton, Baker Mayfield, Carson Wentz and Mitchell Trubisky. The important thing to remember here is we’re not discussing NFL QBs as much as we are talking fantasy production. Wilson, Watson, Trubisky and Cam all have huge statistical rushing advantages over Mayfield which to me absolutely lowers his potential ceiling. Wentz and Goff for the time being play in more fantasy friendly offenses. My case being of the 10 QBs I listed there is a decent case for all of them to be in the four or five spot for dynasty QBs but Baker’s case is possibly one of the worst of those 10. The lack of experience from his coaching staff worries me and his lack of rushing numbers hurts him. We live in a time where guys would much rather roster Phillip Rivers and Derek Carr for super cheap rather than paying top value rookie or startup value draft picks to acquire a guy like Baker. Again I love Baker Mayfield but right now I have him as my QB7 this is no slight to him and I don’t think Garret is far off on his take of Baker potentially being top 5 but heading into 2019 I’m not buying it just yet.